Girl Skins PE Free for Minecraft PE (Pocket Edition Skins) App Data & Review - Entertainment - Apps Rankings! Girl Skins PE Free for Mine..
Change your skin in Minecraft PE! Choose from tons of different girl skins for your new Minecraft PE skin. Please Note: You must have Minecraft PE installed to apply your skin. Disclaimer: This is an unofficial skin app for the game, Minecraft. This application is not affiliated in any way with Mojang AB. The Minecraft Name, the Minecraft Brand and the Minecraft Assets are all property of Mojang AB or their respectful owner. The applications Girl Skins PE Free for Minecraft PE (Pocket Edition Skins) was published in the category Entertainment on 2015-07-17 and was developed by Simplecto. The file size is 19.72 MB. The current version is 1.3 and works well on 7.0 and high ios versions. 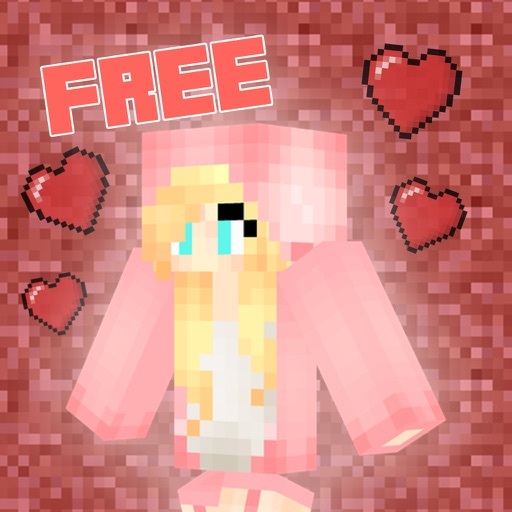 Do you like Girl Skins PE Free for Minecraft PE (Pocket Edition Skins) applications? Please share! Ok, they are only TWO FREE SKINS, and they are terrible. What's the point of this app anyway? Was it to give girls more skins that they can use in Minecraft? Because this FAILS. I do not recommend this. Completely a waste of my time I wanna be a circle! This app is great ! If you buy one skin it gives you all the skins. Also all you have to do is press save skin on the skin you want go on to Minecraft go to settings and press browse and the skin you want will be there. This app is great! If you want to waste your precious time! The picture previews say " These skins and more!" Its lying. if the app says FREE it should be FREE. You look at the app, "Oh this looks cool!" You get the app, and start browsing the cool skins. "Wow I really like this one!" You say. Then, you peer at the bottom of the screen. "$0.99 for cheap Minecraft skins!?" "That's a load of bull crap!" The two Minecraft skins you actually get free aren't worth anything. you can make them easily yourself. If not all the skins are free, you should put " Get two skins free." Next time your fixing up your game, think about the customer, not your bank account. Really? There are literally only 2 skins if you don't buy full version. Plus the skins a terrible. Seriously? This is such a ripoff. 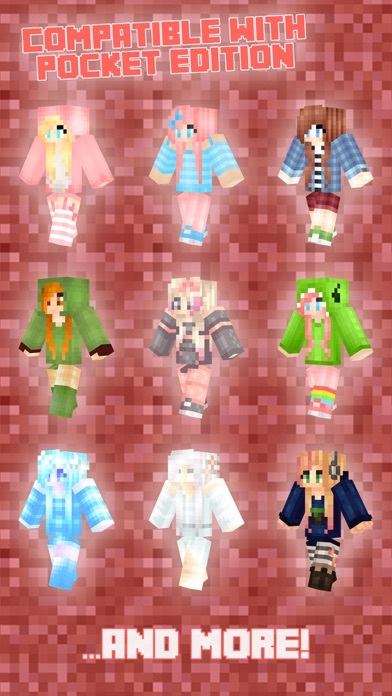 I recommend skinseed instead it has everyone of these skins completely free! And they have a ton of other ones you can even look on your favorite websites for the skins. Hi. I'm here to complain about this horrible scam. So first, I'd like to point out how it says "FREE" in the app icon. This is a lie. You get 2 of the ugliest Minecraft skins and the rest cost $.99. If you want a good Minecraft Pocket Edition Skin app, get the totally free app "Best Skins for Minecraft Game". Not only do they have totally cool girl skins, but they also have cute guy skins, scary monsters, silent but deadly ninjas, and warriors, rogues, zombies and TONS more! Get "Best Skins for Minecraft Game" and I will guarantee your happiness! It's so funny how you think your going to get people to buy this! Only two skins? Really seriously? I go online and there's plenty of skins. And guess what there FREE! Beat that!